February brings some of the most fun holidays to celebrate to the world: Setsubun in Japan, the Lunar New Year in China, Presidents Day, and of course Valentine’s Day. 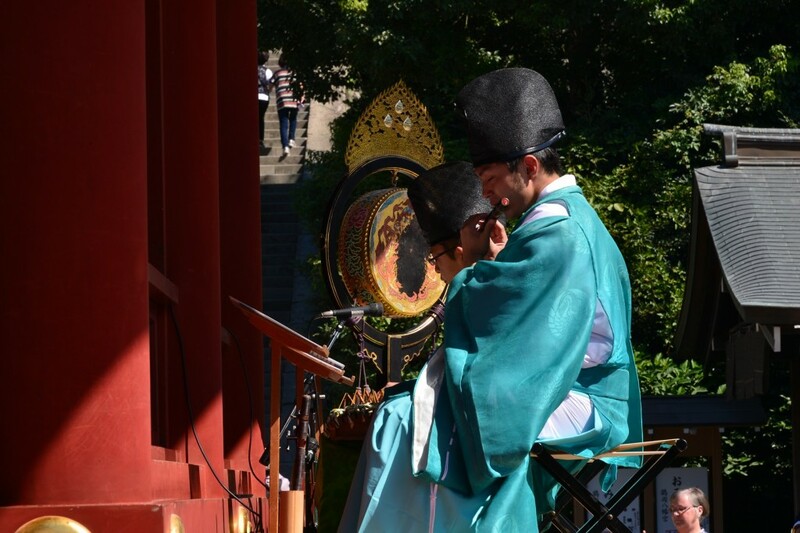 What better way to celebrate your love for Japan than to learn about traditional Japanese weddings? 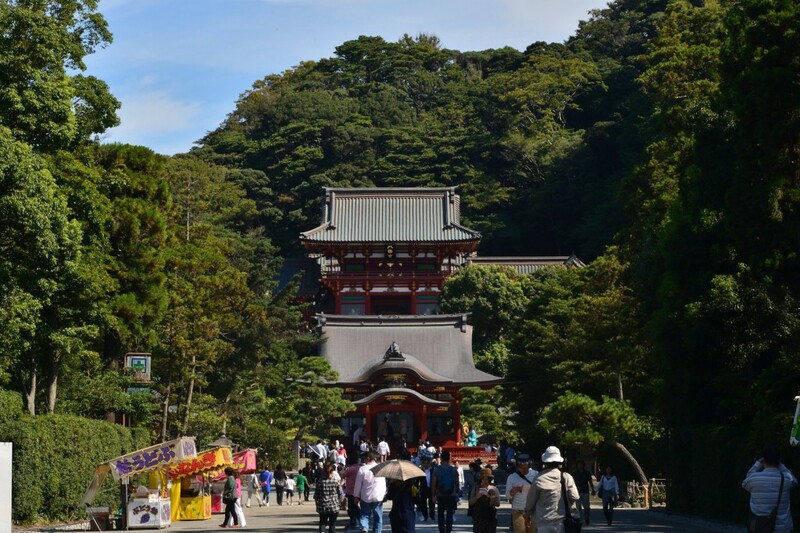 Tsurugaoka Hachimangu is a shrine complex with a rich history just a few minutes away from the Kamakura Station. 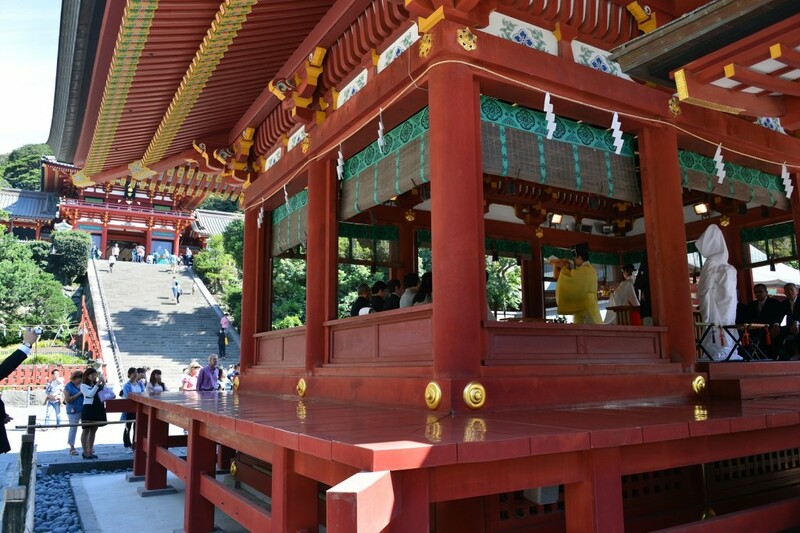 Indisputably the most important shrine in the city of Kamakura, Tsurugaoka Hachimangu is home to museums and hosts many important festivals, including the Japanese wedding ceremony. 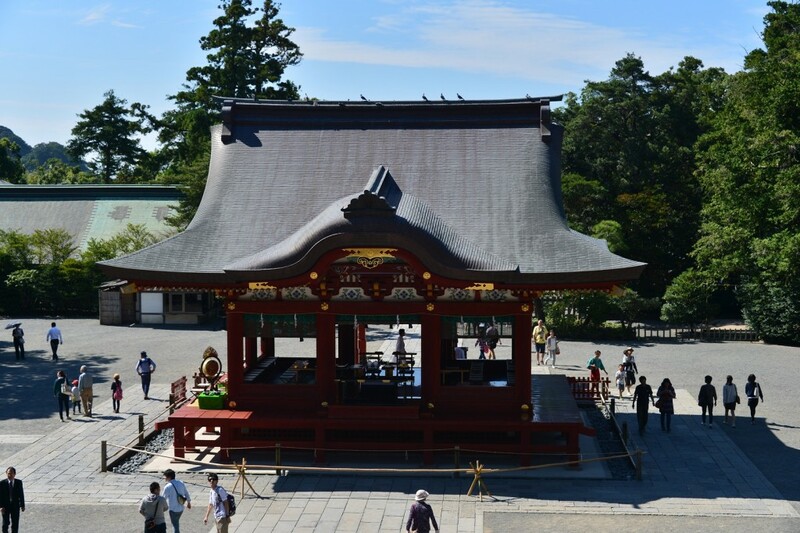 Originally designed in 1063, this shrine complex was engineered to follow the principles of Feng Shui, offering protection from every carnal direction from the four legendary animals: Genbu (Black Turtle), Suzaku (Red Phoenix), Seiryu (Blue/Green Dragon), and Byakko (White Tiger). It was also once home to a 1,000 year old ginkgo tree that was torn from the ground during a storm of 2010. 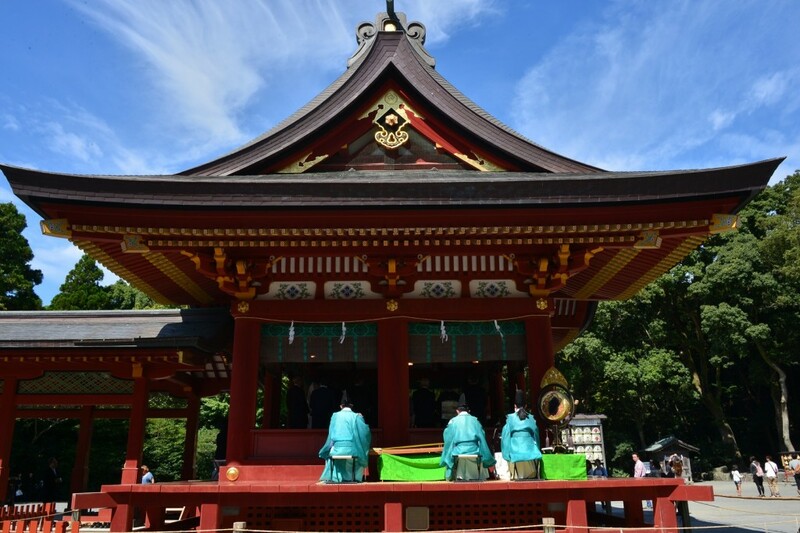 Tsurugaoka Hachimangu is also historically known for the assassination of the Shogun, Minamoto no Sanetomo on February 12, 1219. Though it is often mentioned that Kugyo, nephew of Sanetomo hid behind the ancient ginkgo tree before delivering the fatal strike, but the lack of contemporary evidence indicates that this was an embellishment and dramatization of the event created during the Edo era. 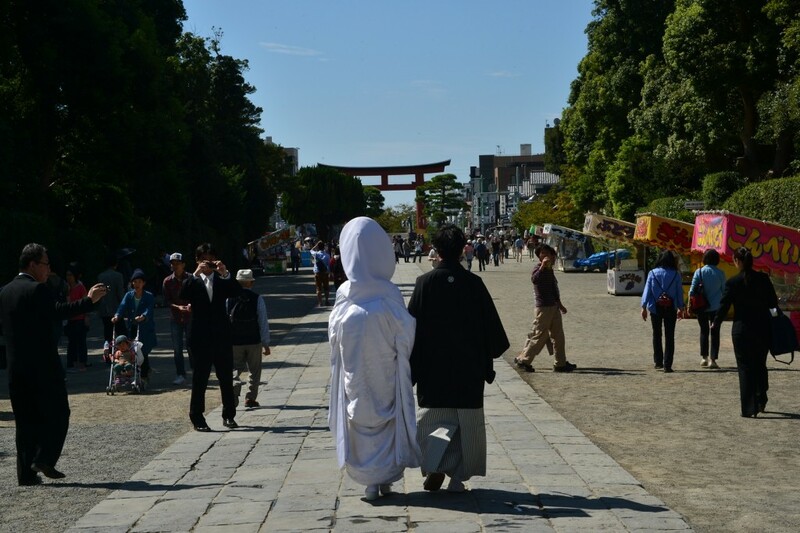 Accessing the temple complex is easy; just a 10-15 minute walk from the Kamakura JR Station.The sando (temple approach) is one of the most romantic and distinct features of the temple, stretching for over a mile long. The pillars of the torii gates are created gradually wider, making the illusion of being longer than it is. Lined with sakura trees, the temple approach is famous for being not just one of the most unique, but one of the most beautiful. 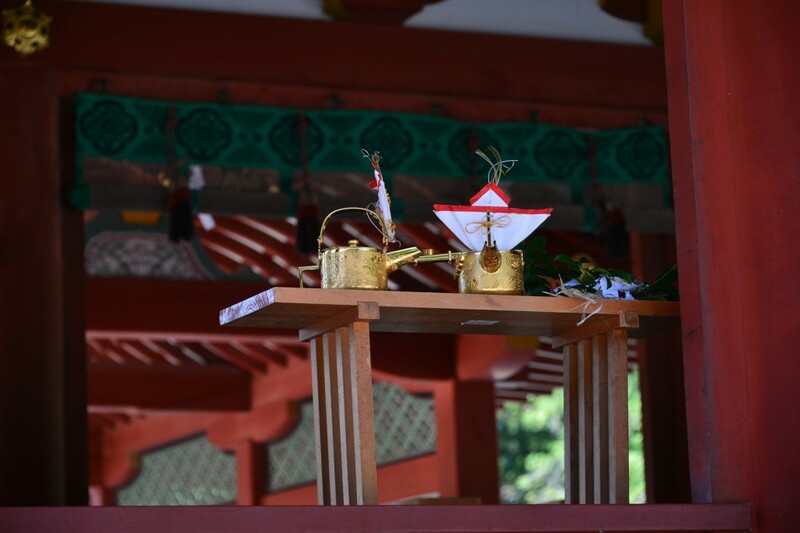 The Shinto wedding is a ceremony of purification, where both the bride and groom exchange oaths, over three cups of sake. 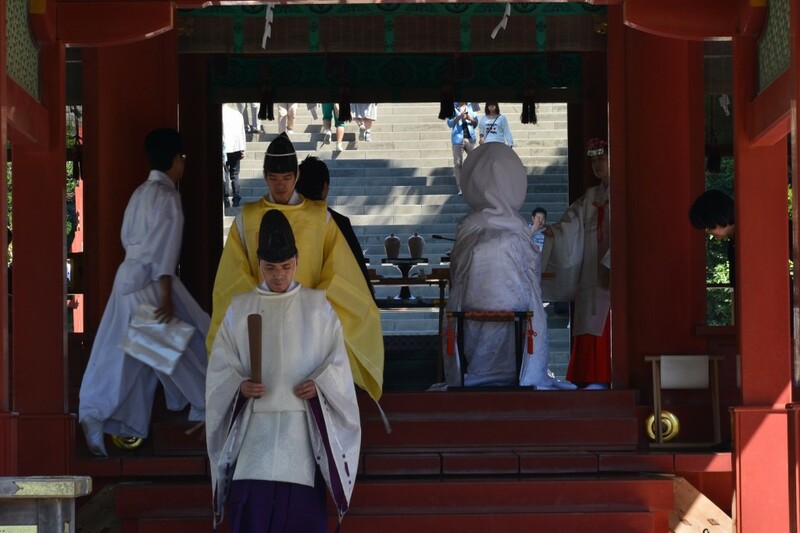 Standing to the right of the altar is a Shinto priest and a Miko (shrine maiden) to the left. 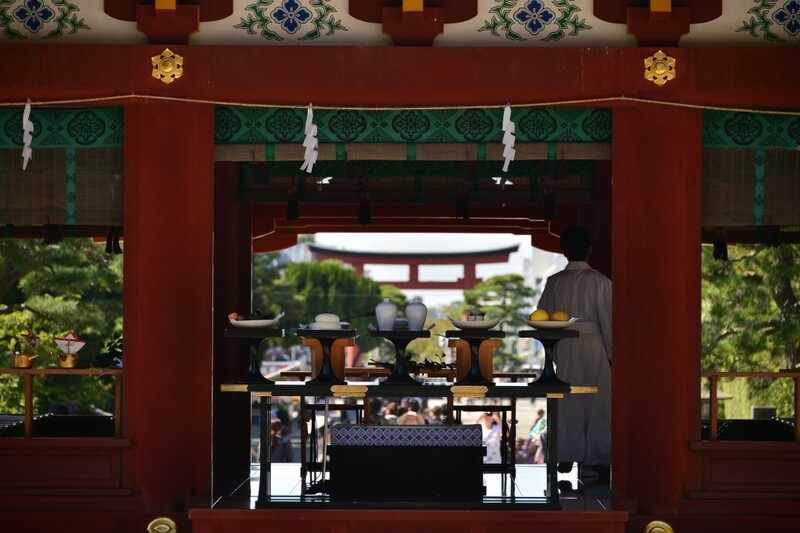 The priest initiates the ceremony by announcing “Three, three, nine times,” representing the cups of sake that are poured three times, finished in three sips. While the sake sharing is considered to be the most important part of the Shinto wedding, there is no conclusive origin to the symbolism of these numbers. There are many speculations regarding the origin and meaning behind this ritual, including joy and sorrow, fertility, a family of three (man, woman, child), and many more. 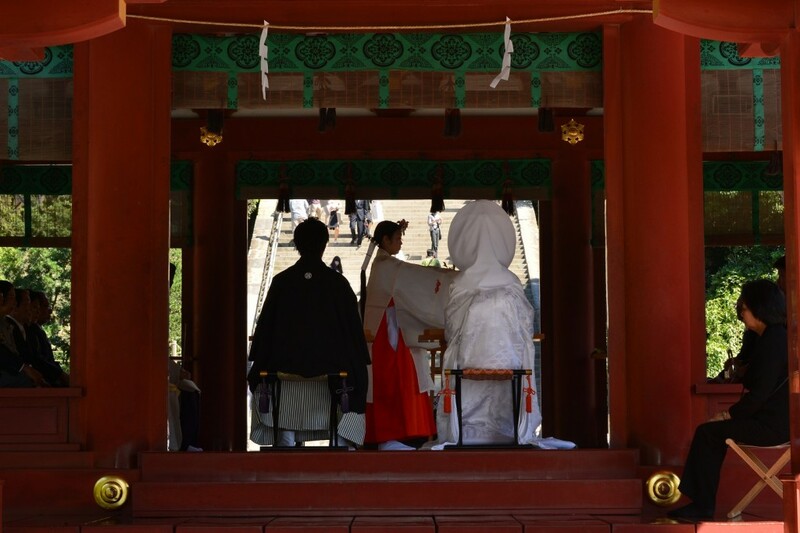 Both the bride and groom of a Shinto wedding wear a traditional kimono in red or white, the colors of purity in the Shinto faith; the bride often wearing a paper crafted hat with wig. After vows are verbally exchanged, the matchmaker is thanked; in the case of none, a family member or friend will fill this role, similarly to a best man or bridesmaid of western weddings. All wedding guests (usually a small group of family, but not exclusively) give a cheer to congratulate the newlyweds. 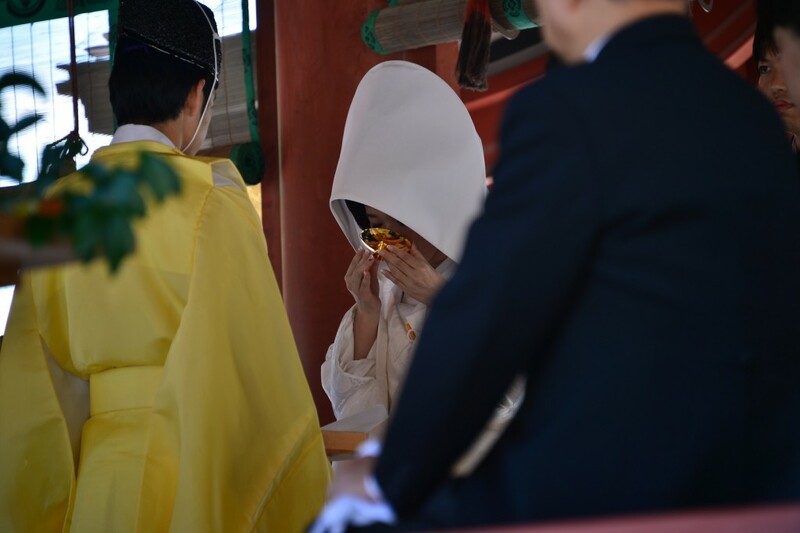 The priest makes closing rituals, followed by presentation of rings for the newlywed couple. 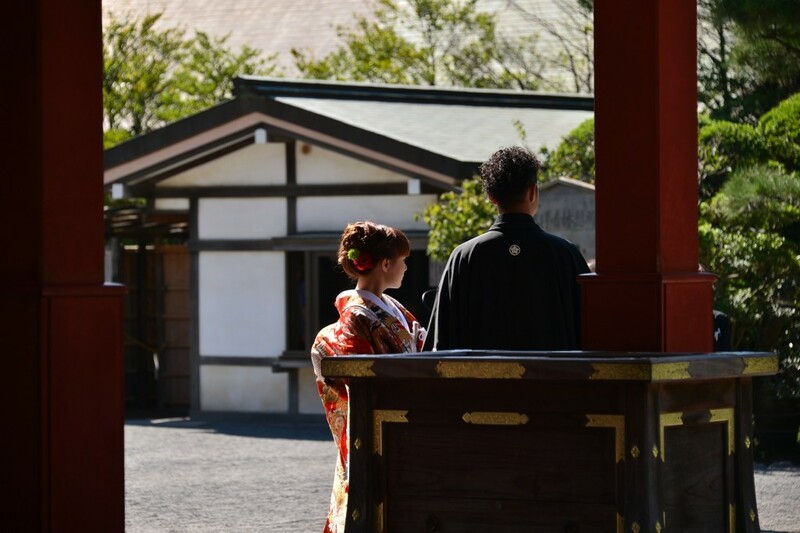 While it’s a commonly celebrated ceremony today, Shinto weddings are a modern creation and were not recorded until the 1880s along with many other Shinto ceremonies. When the Meiji Administration discontinued to fund as many shrines, Shinto Priests made an initiative to increase interaction with faithful patrons. The majority of Shinto weddings today are actually done in more conventional venues, such as hotels or other venues specifically for weddings. We wish you a happy Valentine’s Day, whether you want to take that special someone to Japan, or you’re going single and happy! please visit our Luxury Escapes website or call 1-888-364-7118.